Very simple to put together, this nourishing soup is a favorite for weekend lunches. It freezes very well. Rinse and drain split peas. 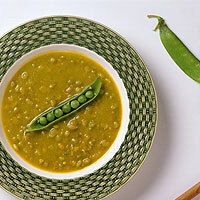 Combine dried split peas, water, bay leaf, and salt in a large soup pot. Bring to a boil and then reduce heat and simmer for 1 hour. Stir occasionally to prevent the split peas from sticking, and to make sure that there is enough water. Add water if the soup looks like it is becoming too dry. Add carrots, celery, onions and seasonings. Continue to simmer for 30 minutes or longer. Add more water if a thinner soup is desired. Overcooking cannot hurt this soup as long as it is stirred to prevent sticking.